I may be one of the last people who have jumped onto the slow-cooker bandwagon, but now that I have I am finding it a great appliance for busy people, and am wondering what I ever did without it! 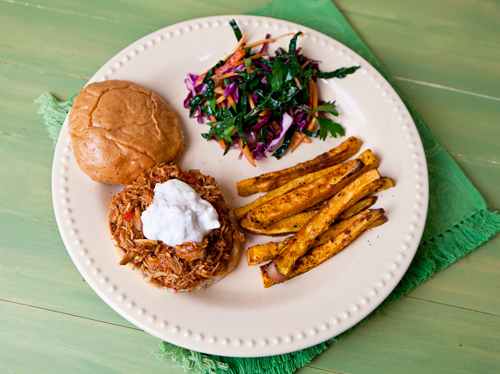 I have recently been working to make some of the usual food favorites that one associates with football parties or tailgating a little healthier and this week I decided to combine the idea of a pulled pork sandwich with the flavors of buffalo chicken wings. I used a mix of chicken thighs (for flavor) and chicken breasts and used my slow-cooker to slowly braise the meat in a spicy tomato and buffalo wing sauce until it was so tender it falls apart. To get the right “pulled pork” texture for this sandwich, you can simply use a fork to mash the meat against the side of the slow-cooker, or even use a potato masher. The meat easily shreds apart at the end of the cooking period. To give the dish an even greater buffalo wing flavor, I made a lighter than usual blue cheese sauce by combining light mayonnaise made from olive oil, fat free Greek yogurt, and blue cheese crumbles. I used a whole wheat bun to keep the sandwich as healthy as possible, and I served my sandwiches with sides of sweet potato fries, and my Kale & Red Cabbage Slaw. Combining fat free yogurt and a light mayonnaise base with blue cheese crumbles creates a creamy blue cheese sauce with less than half the usual calories. 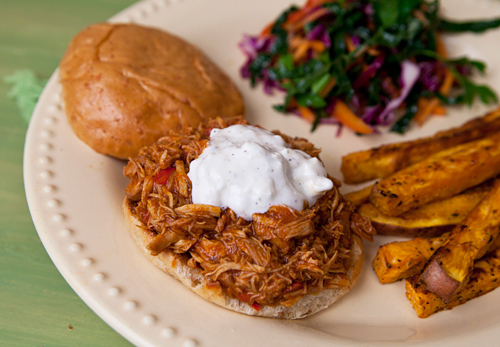 A spicy pulled chicken sandwich cooked in the slow-cooker. In a skillet, heat the oil and brown the chicken meat in batches, placing the chicken into the slow cooker once browned. Cook the onions, pepper, and garlic until softened on low heat, about 5 minutes. Transfer the onion mixture to the slow-cooker along with the tomatoes, wing sauce, worcestershire sauce, mustard, and sugar. Cover the slow cooker and cook on high for 4 hours. Taste, and season with salt and pepper and keep warm. To make the sauce, mix together the yogurt, mayonnaise, blue cheese, salt and pepper, and mix with a fork, crushing the blue cheese into the sauce. Brown the hamburger buns and serve the meat on the buns with a spoonful of sauce on top.